I like to start with provocative titles as it get many of you to actually go to my blog post and read it. But this one may not be an exaggeration, and I will tell you more. First of all, please forgive me for not posting in such a long time. I have been unusually busy, even for me. In a few days from now, I will be revealing how I have spent the bulk of my time over the last year and a half. Some of you who are my friends know that I have been working very hard on a “secret” project. For those that don’t know much about my background in medical science, you will be surprised. If you weeks ago Apple had a major announcement which focused on an update to the iPad air, iPad mini the, the Mac Mini, and a brand-new high ultra high-resolution iMac. I, of course, wentAnd Apple store see these new products and most likely buy something. I don’t think there’s ever been a major Apple announcement that did not result in my purchasing at least one product, so I had the same expectation this time. However, I walked out of the store empty-handed. There just wasn’t enough improvement in the iPad Air iPad Mini. For me to want to upgrade. I only have the iPad air and have never had an iPad mini, so that was the only one I was considering. Other than being a little bit better thinner and having fingerprint touch capability, there wasn’t anything compelling. The Mac Mini was a real disappointment, but that is key to what I’m about to write. The versions that they were offering were actually less powerful than the Mac Mini I bought two years ago. I thought that was strange. The only product I desired was the new 27 inch ultra high definition iMac. That display is amazing. But I don’t want to buy an iMac. I believe that it is better to separate a displaySpace from the computing element you want to use a notebook computer has a desktop replacement when you are in at your home office for instance. The reason for this is that the computing elements change much faster than the display almonds. So that means I could have a display for perhaps four years but change the computing element every two years. If it weren’t for that, I would deathly have bought the iMac. I also like having a Mac Mini. The main reason for this is that I have two homes. In each home I have a cinema display, keyboard, trackpad, etc. I can easily carry my Mac Mini with me when I go from home to home and in a sense I brought my entire set up with me. Of course, things are getting easier now that we have much of our data on the cloud, and we synchronize from there. Display. Finally, there are companies who have been using Mac mini as servers and rack mounting them. 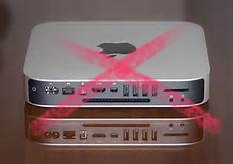 I think they are the ones were probably most upset about what’s going on with the Mac Mini. So the iPad Plus could be a substitute for the Mac Mini as an entry-level product. However, it doesn’t provide the functionality that one wants to have in an actual computer. I think many people are still interested in using a keyboard and perhaps this is a capability that Apple will offer with the iPad Plus although it seems out of character. I have to say that I believe the current architecture for computers is up for a major overhaul. There is no reason you could not put enough power into a form factor as small as a phone especially with the data stored in the network/cloud. My phone or my iPad could communicate wirelessly to a large display, in fact, my iPad could just be a display, and my phone could become the only computing element that I carry. Then whenever I get near a display and keyboard, etc. I could turn it into that in essence my desktop. Clearly there is going to be overlap between the iOS in OS X world. Apple probably would like to minimize this overlap and to accomplish this it has to happen in the high-end of the iOS and low-end of the OS X world. So I guess goodbye Mac Mini. Apple probably doesn’t like the idea that you could buy an Apple computer, but not use an Apple monitor. I suspect that Apple is investing a lot of resources into developing ultra high definition monitors. So even though I desire to separate the monitor from the computing platform they may not be giving me a choice in the future. They will have to offer an independent monitor as a second screen for notebook computers. Why has the Macbook Air has not been upgraded in any substantial way for a long time? That would have me stumped a bit, and I do suspect that we will see an improved MacBook Air when the newest processor is released by Intel. I certainly hope so. I’ve been wanting to buy an improved MacBook air for some time and was hoping this would be the time. Guess not. I think this market is never important to Apple, and they are prepared to give it up in order to focus on other opportunities. Tags: iPad Plus, Mac Mini. Bookmark the permalink. As always, a great, thought-provoking article. I’m looking forward to reading about your secret medical science project. I have no doubt it will have just as much impact on the world as all of your previous endeavors have had – best of luck with it. Was this dictated? Seems like enough strange sentence constructions with homonyms that it might have been. Interesting post. Can’t wait to hear what you’ve been working on! Can’t wait to hear what you’ve been working on……. hmmmm. Can I guess? Sure go ahead and guess! Best wishes on whatever project you are undertaking. For my desktop system I have a Mac Mini for the same display reasons as you mention. I have a first gen Apple LED Cinema and expected it to outlast several Minis. I’m about due for another Mini replacement, so this is indeed bad news for me too. When the new Retina MacBook Pros (MBP) came out, Apple dropped the 17″. This was a huge disappointment for me and I rushed out to buy the lastest refurb 17″ unibody MBP that I could to replace my old one and will try and keep it going for as long as I can. What will Apple dumbing down their latest iWork apps to make them work more like their IOS counterparts, plus what I see as the erosion of their computer line, making their offerings less suitable for the software professional, it seems like only a matter of time before I once again return to Linux for my desktop and portable systems.